Sprint gets BlackBerry Pearl and Motorola Q9c | BlackBerry Blast! 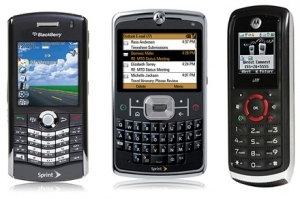 Sprint is finally offering the BlackBerry Pearl 8130 and the Motorola Q9c and i335 phones. Many users have been waiting patiently for these new phones and they are finally available at Sprint. All three phones are available for very reasonable prices after signing a 2-year agreement. The i335 is on sale for $49.99, while the Motorola Q9c goes for $149.99. The BlackBerry Pearl 8130 rounds out the list at $199.99. Again, all prices require a 2-year agreement with Sprint.